Kari, the abalone pearl I purchased from you has just been set in a beautiful, brushed gold 18k setting. The design was influenced by beautiful rings offered in the past by Kojima pearl. I wanted to share it with people that could appreciate this unique natural abalone ring. 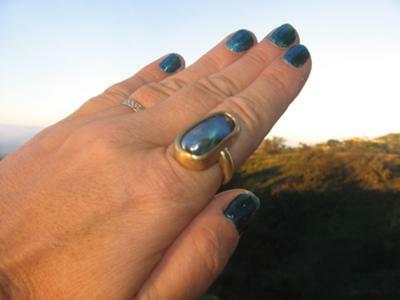 I love the ring you had made from the 25mm abalone pearl...great job! It's beautiful! The gold sets it off just right and so do your blue nails :). 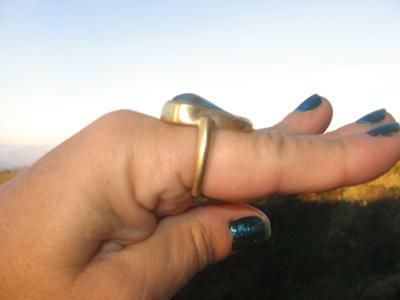 Just by the way you hold your hand with the abalone pearl ring on it shows it was made just for you. I really enjoy seeing what folks do with their natural pearls.